Geologic Mapping, Inc. provides a full range of geologic and ground-water hydrologic consulting services. Our expertise is based on broad experience, not only in all aspects of the geological sciences, but also in regional experience throughout the Western U.S. and other areas. We are based in the small town of New Harmony, southwestern Utah, which looks east across the Hurricane fault zone to the northern tip of Zion National Park. New Harmony is between Cedar City and St. George, Utah, and is centrally located with respect to other parts of the Southwest, including Denver (600 miles away), Las Vegas (150 miles), Los Angeles (400 miles), Phoenix (400 miles), and Salt Lake City (250 miles). We collaborate with a wide variety of senior scientists in other fields and locations, who provide help and expertise in additionally broad areas. In our analysis of geologic and hydrologic problems, we rely on geologic maps, whether those of others or those we make. 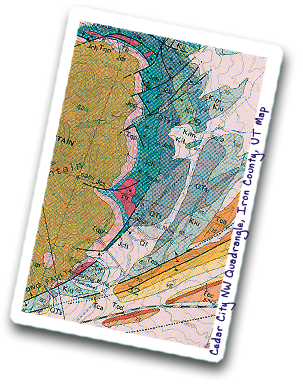 The images above and below present an assortment of geologic maps and geologic cross sections that we have published. Business Philosophy: To produce useful reports and to issue objective advice at deadline on a wide range of practical topics in geology and ground-water hydrology. Our geologic studies, which specialize in field work, deal with real-world applications of these two scientific fields. In other words, solving problems and studying issues relevant to practical concerns are emphasized. Assessments and reports are done at the highest professional standards and are understandable to both the professional and the layman. Geologic mapping, any scale, Western U.S.A.